With Atlantis and Endeavour now in their dual processing flows for the STS-125 mission to the Hubble Space Telescope, NASA managers have updated plans for shuttle Atlantis’ next mission – STS-129 – via the Launch Site Flow Review (LSFR). Highlighting the ever-fluctuating nature of the Space Shuttle Program (SSP), STS-129 was originally scheduled to fly with Discovery; however, delays to the Hubble Space Telescope servicing mission forced NASA to realign its downstream flight manifest – resulting in an orbiter swap from Discovery to Atlantis. With the change of orbiters, as well as changes to the mission’s middeck payload, flight planners are now projecting an Ascent Performance Margin of 1,101-lbs for STS-129 based on a November 12 launch. Furthermore, the 106 page LSFR presentation – available for download on L2 – shows that Atlantis will not exceed any weight limits for the nominal abort modes available to her Flight Crew in the event of an emergency during launch. 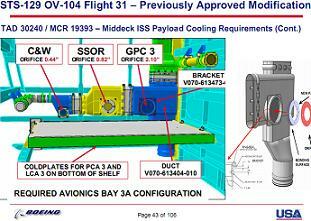 However, Atlantis’ weight will exceed the Contingency Return weight limit set forth by the SSP. “CONT RTRN exceeds 233,000-lbs Nominal End Of Mission limit,” notes the LSFR presentation. This, however, does not appear to be of great concern to the SSP as there is no further mention of this issue in the LSFR presentation. Currently targeting launch No Earlier Than November 12, 2009, the STS-129 mission will see Atlantis deliver the Express Logistics Carriers 1 & 2 (ELC-1 and ELC -2), along with SASA and MISSE (Materials on International Space Station Experiment) 7A and 7B, to the Space Station. Additionally, the all-powerful Program Requirements Control Board (PRCB) has filed a Change Request to add RAMBO-2 (a Department of Defense payload of opportunity) to the mission. The addition of this payload is scheduled to be discussed on April 27. As with every OPF (Orbiter Processing Facility) flow, Atlantis will undergo a series of configuration changes/upgrades during her scheduled 127 day stay in the OPF. The first such modification scheduled for Atlantis is the redesign of the gaseous hydrogen Flow Control Valve (FCV) elbow – a modification necessary to provide additional protection for Atlantis in the event of a FCV liberation and impact event in the gaseous hydrogen lines. “Proposed redesign of the FCV elbows involves increased wall thickness, a change in material from CRES 304L to 21-6-9 steel, and a longer elbow arm eliminating a tube section and braze joint downstream of each elbow,” notes the presentation. The redesign will be installed in all six downstream gaseous hydrogen line locations. Further, while this safety modification will result in a marginal weight increase for Atlantis, the alteration of the FCV elbows will not require “vibration testing.” Rather, the modification will be certified for flight by analysis. More will follow in an upcoming article based on the FCV forward plan presentation, which was reviewed by last Thursday’s PRCB, relating to missions STS-125 and beyond. 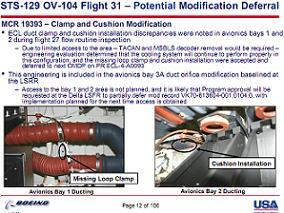 The second issue, first discovered during Atlantis’ flow for the STS-115 mission back in 2006, relates to an Extended Capture Latch duct clamp and cushion installation discrepancy in avionics bays one and two. Because of limited access to the area in question, program engineers analyzed the situation back in 2006 and determined that the affected system would continue to function properly. 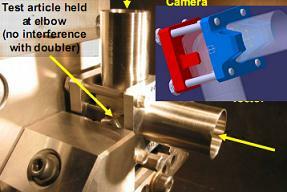 As a result, the SSP accepted the condition and deferred replacement of the duct clamp and cushion until Atlantis’ next Orbiter Modification Down Period (OMDP). Since Atlantis was originally scheduled to retire after STS-125, the duct clamp and cushion issue would not need to be dealt with as Atlantis would retire before her next OMDP. However, NASA managers later decided to retain Atlantis for service to the Shuttle program through 2010, thus giving Atlantis two additional flights and bringing this issue back to the table for discussion. Also, additional upgrades to Atlantis will include the installation of a resized orifice to middeck avionics bay 3A, the modification of wiring for the oxygen crossover valves, a change to the external airlock ducting configuration, the removal of a recorder box from the left OMS Pod, and the addition of acreage doublers to avionics bays four, five, and six. For the middeck avionics bay airflow reconfiguration, the ISS payload Mice Drawer System, which will be installed in middeck avionics bay 3A will not have sufficient airflow to “to accommodate rear breathing payload in the middeck avionics bay 3A,” notes the LSFR presentation. The intended modifications (installing a bracket in the duct to allow the installation of an upgraded orifice) will increase the airflow and provide avionics cooling support for the Mice Drawer System. The new duct modification will reduce the amount of crew work associated with the fan in its current configuration; nevertheless, the option to fly the booster fan bypass duct will still be available to the STS-129 crew. On another front, the addition of acreage doublers to Avionics Bays four, five, and six is a preventative measure to reduce the risk of ground processing damage to the avionics bay doors. Furthermore, work will also be conducted on Atlantis’ Rudder Speed Brake (RSB) inconel thermal barrier tabs. The tabs, which are designed to prevent ascent heating from adversely affecting the RSB assembly and which are not necessary for reentry protection, have a history of coming lose during missions. The most notable example was seen during the STS-124 flight last June when one of these tabs dislodged during the standard Flight Control Surface and RCS hotfire tests the day before landing. Improved ground inspection techniques were added for the STS-126 mission in November. However, despite these efforts, seven tabs were found to be missing when Endeavour returned to KSC. For STS-129, the redesigned inconel thermal barrier tabs will improve the strength of the tab’s attachment to the inside of the RSB. 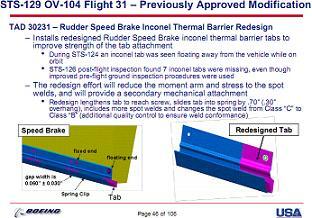 “The redesign effort will reduce the moment arm and stress to the spot welds and will provide a secondary mechanical attachment,” notes the presentation. Additionally, ground technicians will also be charged with conducting a mandatory structural inspection of Atlantis’ Wing Leading Edge (WLE) spars. These inspections, which would normally be conducted during an OMDP or a prolonged OPF flow, are due for Atlantis by January 22, 2010. Since this date is before the final manifested mission of Atlantis – and since the last complete inspection was back in 2003 – Program managers developed three working options for this issue. The first solution was to simply extend the time between inspections, therefore negating the necessity to conduct the intrusive inspections (which requires the removal of several RCC panels) during the 129 flow. Nevertheless, the SSP decided that it could not accept any justification for not performing at least some of the inspection. To this end, Atlantis’ engineers will perform WLE spar inspections of RCC panels 9-16 on each wing during the STS-129 OPF flow. The Program is expected to accept the risk of a partial inspection during a PRCB meeting April 24. Furthermore, one final modification for Atlantis relates to her Shuttle Remote Manipulator System (SRMS) – or robot arm. Due to a back-up release stall problem on STS-103 in December 1999 – and the fact that raybestos brakes/clutches are no longer available – the shuttle fleet’s SRMS End Effectors are being upgraded with ceramic material brakes. Endeavour’s SRMS End Effector was upgraded last summer before her STS-126 flight; Discovery’s SRMS End Effector is being upgraded for her STS-128 mission in August. Atlantis is scheduled to have her SRMS End Effector upgraded during the STS-129 flow; however, delivery of the new End Effector is currently two days behind the KSC need date. The presentation notes that the Government Flown Equipment team is working with the KSC team to refine the delivery dates at this time. As always, refinements to Atlantis’ flow for STS-129 will be made over the coming weeks and months after the vehicle returns from the Hubble Telescope servicing mission.